India defeated England to win the first test in the four-match cricket test series at Sardar Patel Stadium, Motera, Ahmedabad. India scored the 77 runs needed for victory for the loss of one wicket in 16 overs in the second innings, thanks to Cheteshwar Pujara who continued his form to score 41 not out. 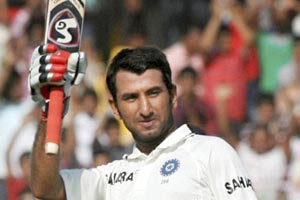 Pujara was declared man of the match for his unbeaten 206 * and 41 *. Indian spinner Ojha took nine wickets in the match.